Description: Belonging to the Cagayan corridor of the Sierra Madre range, Bolos Point is a pocket of biodiversity in the Pacific seaboard. Its remoteness and considerable inaccessibility makes it vulnerable to rampant logging and illegal fishing activities. Conservation and protection through community-based capacity-building have therefore been pursued in this site. Belonging to the Cagayan corridor, one of the four identified corridors in the Sierra Madre mountain range. 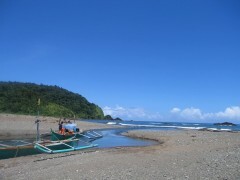 The only coastal barangay in the municipality of Gattaran in Cagayan. Featuring rugged terrain, steep mountain slopes, and narrow coastal strips. As of 2004, 16% of the 11,476 hectares of forest cover in Bolos Point remain untouched. Rattan, a highly sought-after raw material that is dwindling in most parts of the country, still flourishes in the area. Rich in coastal and marine resources, particularly sharks. Part of the migratory path of dolphins, whales, and sea turtles. The population is mostly comprised of Ilocanos (approx. 85%), but there are small populations of Aeta and Igorot IP groups. Vulnerability to rampant logging and illegal fishing activities (e.g. use of dynamite and cyanide) as a result of inadequate law enforcement action in the area, which is in turn mostly attributed to the remoteness of Bolos Point. There are also legalized logging activities that might be serving as fronts for illegal operations since cutting outside the permitted area is commonplace. Rattan is in danger of being depleted, given the rate of extraction. Marine fauna species with greater conservation needs, such as sharks, dolphins, and turtles are being exploited because of their high commercial values. Research on baseline data for Bolos Point’s natural resource and socio-economic profiles. Formation of the Cagayan Council for Sierra Madre Biodiversity Corridor (CCSMBC), a multi-sectoral collaboration which has mobilized the passing of an Executive Order by the provincial government declaring the Cagayan Sierra Madre Biodiversity Corridor as a Protected Landscape and Seascape. Formation and capacity-building of five sectoral organizations representing the indigenous people, women, fisherfolk, farmers, and a consortium of NGOs/POs for the conservation of Sierra Madre de Cagayan. Continuous PO training has increased the community’s knowledge on biodiversity conservation and organizational and financial management. Establishment of important linkages between local communities, NGOs/POs, local government, and other stakeholders involved in the area. Strong advocacy for indigenous peoples’ rights and development of information-education-communication (IEC) campaigns for students. Provision of farm supplies, motorized banca, and fishing equipment to support sustainable livelihoods. Installation of a communal irrigation system and the development of a rattan training project, rice enhancement production program, organic fertilizer production, fish processing, and salt production. Establishment of a meeting area/resource center, resource management zone, sea turtle nesting ground, agro-forestry nurseries, demo farms, and sari-sari stores. FPE’s CBRM project in Bolos Point is complementary to ongoing (double check, maybe this has already ended if lifted from 2004 reference?) initiatives of the Sierra Madre Biodiversity Corridor Program (CI-Philippines, USAID) within or adjacent to Gattaran.